by Roblyer, M. D.; Hughes, Joan E.
Long recognized in the field as the leading educational technology text, Integrating Educational Technology into Teaching links technology integration strategies to specific learning theories, shows pre- and in-service teachers how to plan for technology integration, and offers opportunities to practice integrating technology by designing curriculum to meet teaching and learning needs. Carefully selected exercises, sample lessons, and recommended resources encourage teachers to reflect on their practice as they develop the insights, knowledge, and skills they need to infuse technology across all disciplines. 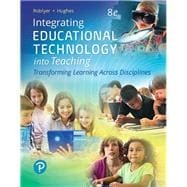 The 8th Edition features updated technology integration and assessment frameworks, helping teachers employ technology in a way that revitalizes students’ interest and engagement in learning. Throughout the book, content is updated to align with the latest ISTE Standards for Educators and Students and showcases the most current tools, methods, and ideas shaping the role of technology in education. Integrating Educational Technology into Teaching is also available via Revel™–an interactive learning environment that enables students to read, practice, and study in one continuous experience. M.D. Roblyer was a technology-using professor and contributor to the field of educational technology for 35 years. She authored or coauthored hundreds of books, monographs, articles, columns, and papers on educational technology research and practice. Her other books for Pearson include Starting Out on the Internet: A Learning Journey for Teachers; Technology Tools for Teachers: A Microsoft Office Tutorial (with Steven C. Mills); Educational Technology in Action: Problem-Based Exercises for Technology Integration; and Introduction to Instructional Design for Traditional, Online, and Blended Environments (2015). Dr. Roblyer began her exploration of technology’s benefits for teaching in 1971 as a graduate student at Pennsylvania State University, one of the country’s first successful instructional computer training sites, where she helped write tutorial literacy lessons in the Coursewriter II authoring language on an IBM 1500 dedicated instructional mainframe computer. While obtaining a doctorate in instructional systems at Florida State University, she worked on several major courseware development and training projects with Control Data Corporation’s PLATO system. In 1981—1982, she designed one of the early microcomputer software series, Grammar Problems for Practice, for the Milliken Publishing Company. Dr. Roblyer retired in 2015 after having served as teacher, professor, graduate student mentor, doctoral student dissertation chair and committee member, and leader in shaping educational technology’s changing role since 1969. She lives in Chattanooga, Tennessee, where she is active in local political and community work. She is married to fellow Florida State alumnus Dr. William R. Wiencke and is a proud mother of daughter Paige Roblyer Wiencke. Joan E. Hughes has been a technology-using educator and contributor to the educational technology field for more than 25 years and has authored or coauthored more than 100 journal articles, book chapters, proceedings, research conference papers, and practitioner conference papers worldwide. After earning a bachelor of arts degree in English from Pomona College, she began working in the educational technology field as an elementary and middle school computer teacher in Silicon Valley area of California in the early 1990s. She presented often at the CUE Conference (known then as Computer-Using Educators) and coauthored her first book, The CompuResource Book, a collection of technology-supported lessons. Later, she pursued her doctorate in educational psychology with emphasis on cognition and technology at Michigan State University where she taught courses for preservice teachers in Michigan and inservice teachers internationally in Korea, Japan, Thailand, and England. Her earliest research developed the concept of technological pedagogical content knowledge (TPCK), a theory generated from case studies of English teachers’ learning and use of technologies in schools. This theory has been adapted and adopted widely. Currently, Dr. Hughes is Associate Professor of Learning Technologies at The University of Texas at Austin where she conducts research and teaches about how teachers and K—12 students use technologies in and outside the classroom for subject-area learning and how school leaders support classroom technology integration. She serves on editorial and review boards for several teaching and technology journals and has contributed to leadership of technology-related special interest groups. She is highly supportive of her students’ educational objectives and has guided 47 doctoral and 45 master of arts and master of education degree students to complete dissertations, theses, or reports. She is married to Lee Klancher, a writer, photographer, and publisher (Octane Press). They spend time walking their dogs, running, biking, cooking, and eating in Austin and around the world.